12/24 Months - $33.99 Only 1 left! Finally, a little critter who's just too cute to leave in the dumpster! We kid, of course, because this time it's your child who has become the furry friend from the forest. And instead of crawling around the garbage looking for tasty snacks, this li'l critter is ready to be held and coddled by you, and is super ready for snuggling in your arms or lap! If you're ready to let your little boy or girl transform into a forest animal who wants to hang out with you, all you'll have to do is outfit them with this adorable Baby Raccoon costume for infants! It's made of soft and luxurious velour and faux fur, so it will be both a fun animal style and a comfy clothing upgrade. (Nap time anybody?) But the fun doesn't end there. The soft hood flips over your child's head, and on top are two dark eyes, a nose, and two furry ears that will show off their wild side! 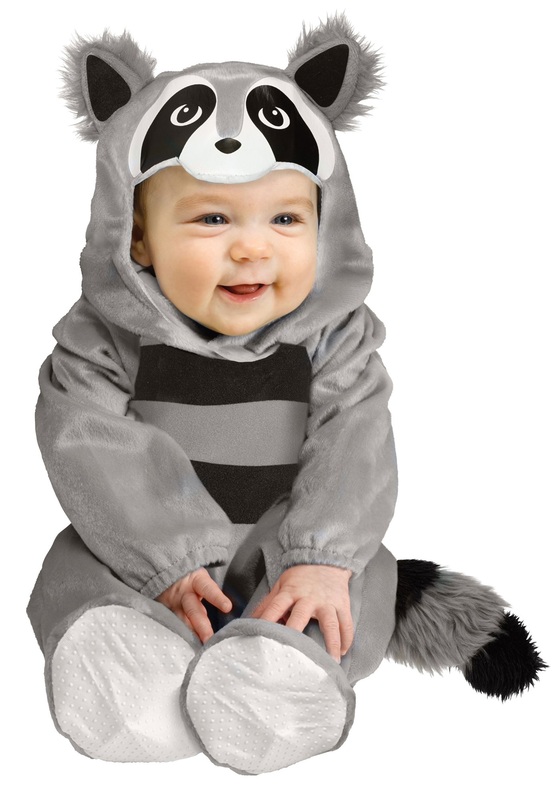 Complete with a furry tail, this romper costume will make any child a part of a critter theme along with their siblings, or you could even make them a little Ms. or Mr. Raccoon Junior to go along with his parents. With easy snap fit for dressing and changing, any little kiddo will look too cute when they go in this look. As long as they stay away from the garbage bin!